I had planned to wake up this morning and just go on a road trip somewhere. 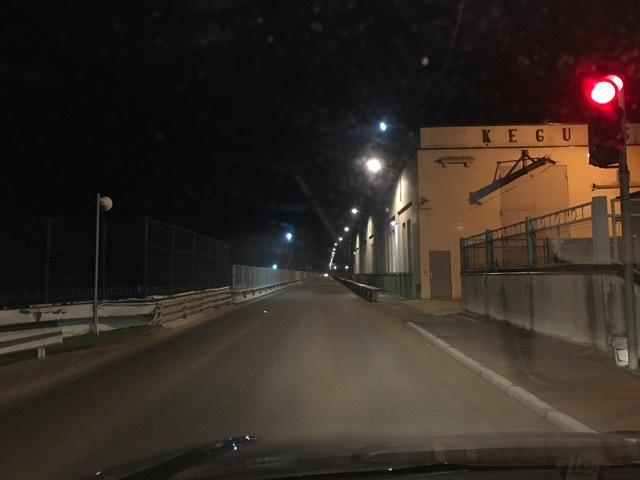 I got started late, but I put my finger on the map and drove some 130 kilometers to Jēkabpils, the tenth largest city in Latvia. 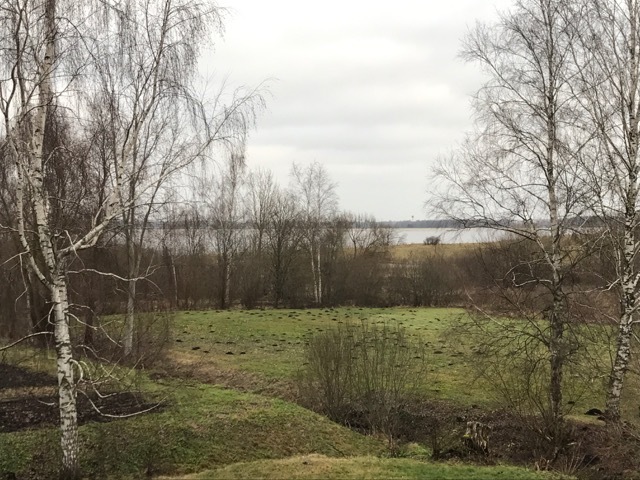 What I learned is that there are no straight lines in Latvia, and probably not in life–not in my life at least. Yes, I tend to get philosophical when driving on strange curving roads along the Daugava river surrounded by the unfamiliar. Think of all the decisions you have made in your life. The big ones. And what led to those decisions? Was it a plan? Some divine line that you drew when you were young until the day you died? I think my brother Paul is the only one I know who seems to have created a trajectory for himself. For me, everything has been more similar to the Formula 1 track at Monaco than any sort of line. I hope that it eventually circles and reveals a purpose, but for right now, I’m in it for the ride, chasing the corners and putting the pedal down on the straights. But back to Jēkabpils (YAK-a-pils). The drive was stunning. I learned that another thing lacking on Latvian roads are speed limit signs. Just so you know, 90 km/h is the speed limit on most highways, but no real Latvian even pretends to follow this limit. I was doing between 95-100 km/h, and suddenly, I would see a car behind me, and VROOOOM, it would zoom on by as if I were standing still. I don’t know where everyone in Latvia is in a hurry to get to, but I would like to get there some day. The other cool thing about the roads is that one minute you’re driving on a perfectly smooth highway, much like any highway you’d find in the states, when suddenly a little sign that shows bumps comes up, and the highway deteriorates into some minefield infested patch of rock that may have used to resemble concrete. But this road does not deter the Latvians, who will pass on a corner, up hill, in the rain, on such a bumpy road without hesitation. Maybe they just don’t fear death? But Jēkabpils. One such corner, brought me on the edge of the Daugava, each turn exposing a more and more beautiful view. I would place that drive on the top ten list of places I’ve ever driven. I only wish the road were better, and the day were brighter, and I were in a 911 Porsche. Someday. 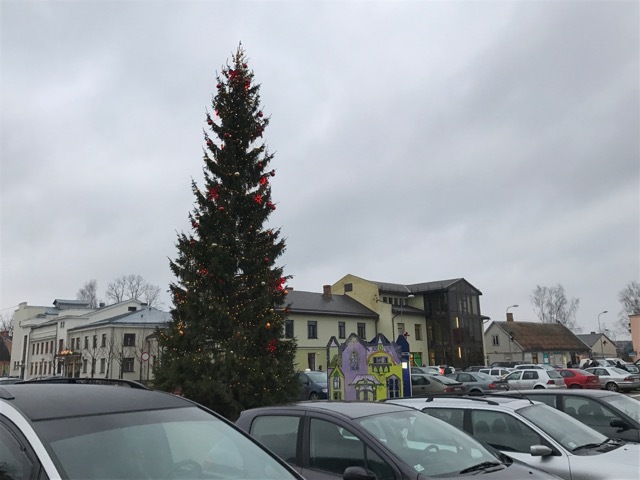 So, I got to Jēkabpils, and after winding and wending my way through the narrow streets, I came to what I believed to be the town square. 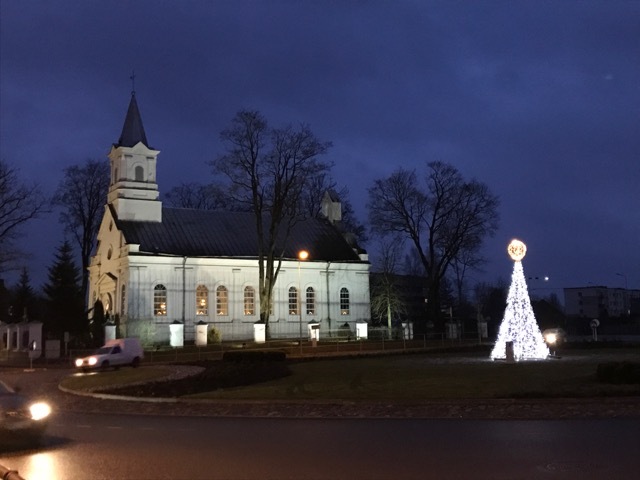 Most larger Latvian towns have these squares, much like any fairy tale or European stop action animation featuring Kris Kringle. A large Christmas tree decorated the square, and shops of all kinds surrounded the space. I began my visit at a small cafe for a cup of coffee and some potato pancakes with salmon. Delicious. The coffee was actually awful, but the food was good. Then I had two goals for the rest of my day: 1) Cross the Daugava on foot, 2) buy some Latvian shoes. I took a stroll taking some pictures of old churches in the fading light, and realized that I wanted to explore my iPhone 7s dark photo capabilities, so enjoy my experiments with light. Two roundabouts later, I found myself heading toward the bridge over the river. It was decorated, of course, with Christmas lights. Traffic was heavy, and there were even several pedestrians crossing the bridge. Everyone in Jēkabpils eyed me in a funny way. I’m not sure if it was the beard or the coat, but I didn’t feel really welcome. The bridge was beautiful and cold. It afforded me a view of the dark river flowing swiftly below with lights reflecting on the surface. 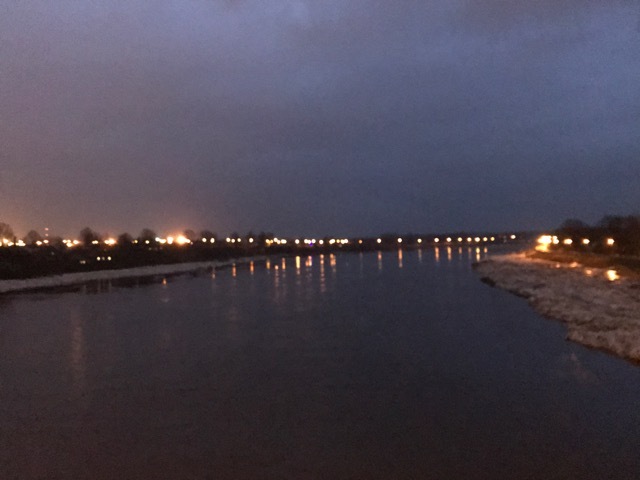 I won’t say that I felt an epiphany, but I did think about how this river basically slices the main part of Latvia in two pieces. So I kept wondering how, back in the day, one tribe would cross to trade with another tribe? How did traditions and language cross this mighty river before bridges? After crossing, I made two quick stops. One was at the supermarket. I was going to leave without buying anything, but the female security guard kept following me, so I bought some kleenex for .59 Euro and walked out. Then I decided to try the little Latvian casino. These are EVERYWHERE throughout Latvia. I suppose they would be in the United States if they were legal. Fenikss, I think is how it was spelled. Word to the wise… don’t go there. If you thought slot machines in America were terrible, the odds are much, much worse in Latvia. I played a game called “Chicago” which was a slot machine that paid out for poker hands. Normally, I could sit and play penny slots for awhile, winning and losing… but in Latvia, with 5 Euro, I think I “won” about ten times… the rest of the time, I just flushed those 500 pennies down the proverbial tualete (toilet). But at least I got to use the water closet (another challenge to find for free in Latvia). I decided that if I ever rule the world, there will be no signs or illusions about using the bathroom. Every single place that has a bathroom will have a fully-functioning public restroom for anyone to use at any time that the place is open. No “For paying customers only” signs or anything like that. Just let me go to the freaking bathroom! Sorry, Jēkabpils… my walk back across the Daugava was splendid. I stopped at an old-fashioned department store on the main street, and by “old-fashioned” I mean JC Penney’s in Wahoo circa 1978 with stairs and all. I found a men’s shoe selection on the top floor, and a wonderfully nice woman was there to help me try to fit my fat American feet into a pair of Latvian-sized shoes. Cetridesmit seis (46) I tried to explain, and she seemed to understand. I actually would have preferred a 46.5 or 47, but 46 is as big as I could find. After searching and trying on shoes for awhile, I felt like I had to buy something. We finally found these cool black and white sneakers that fit well enough. Sold! I said. But when I asked her if she knew somewhere nice to eat, she had no idea. Good thing I have a smartphone. 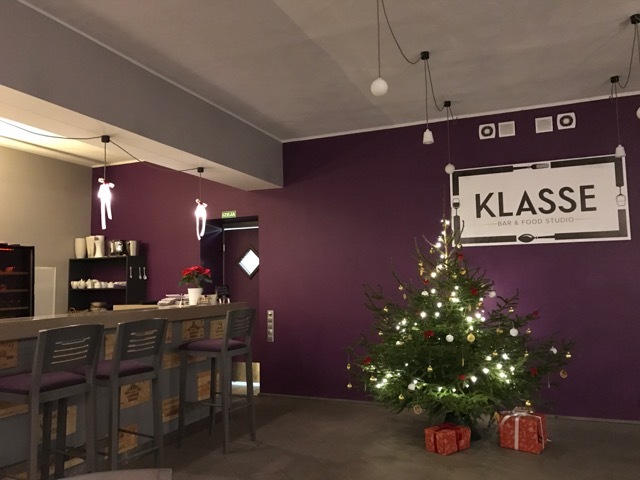 I found this cool place a few blocks from the square called “Klasse.” It had 5 stars on Travelocity (but only 3 reviews). What the heck, it was better than the sushi/pizza combo place in the main square! Sure enough, it was another European masterpiece. I asked my cousin, Gita, about how all these little Latvian cafes, even in small towns, manage to be so cool looking and to have such diverse menus? 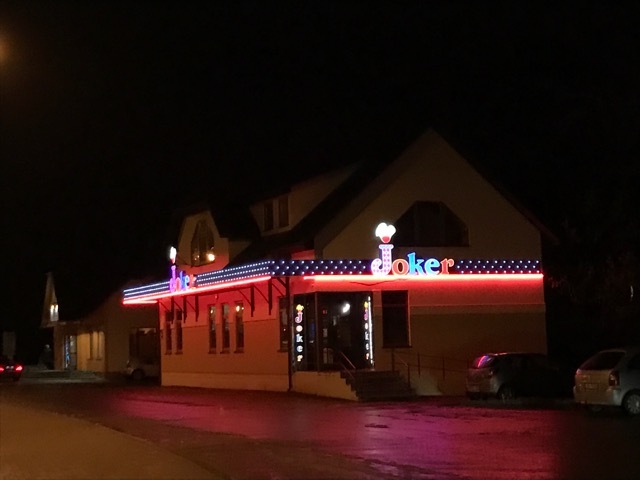 In America, local greasy spoons are run-down bars. If you’re lucky you get some nice kitsch for your dollar, and cheap crappy beer. But here, the places are all decorated, clean, well-lighted, with a full bar and elegant if not gourmet menu options. I asked my waitress, Agnese, what she would recommend. She set me up with the pork fillet wrapped in bacon cooked with plums. I was scared at first, but the plums actually gave it a savory barbecue flavor, and the sauce was delicious. Although what they call spicy here, we call “pretty bland” back home. 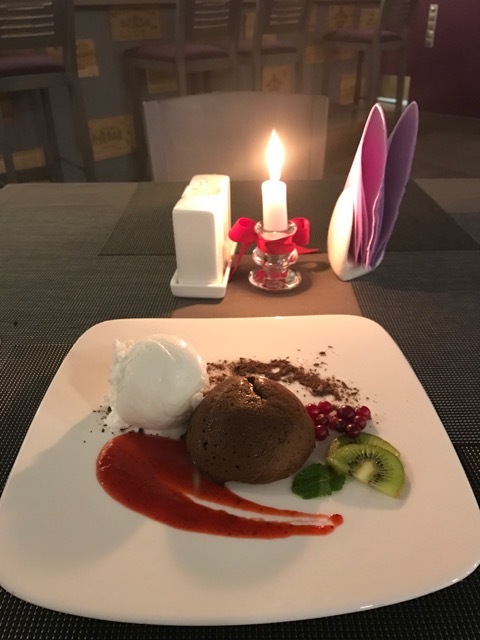 The most amazing thing was the chocolate soufflé I had for dessert. Crisp on the outside with hot, chocolate lava oozing inside. Fresh berries and ice cream topped it all off. Exquisite. 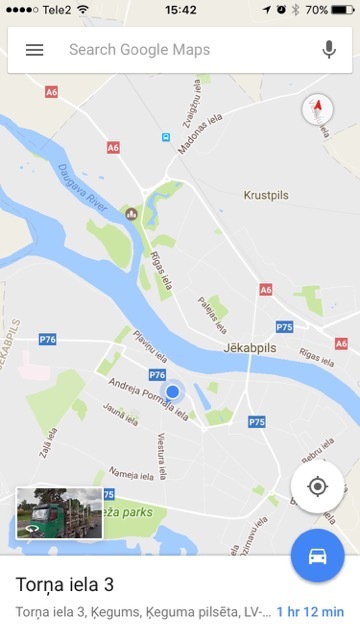 But all things come to an end, so after a quick stop for some beer at the liquor store, I said, “Goodbye!” to Jēkabpils, and took a route on the north side of the Daugava home. It’s too bad it was dark because I’m certain the view from that side would have been just as splendid. The final drama of the journey was just after crossing the dam in Kegums, which was a one-way road due to construction, and a bit hairy at that. I got to the other side, and I saw a dog on the side of the road. I turned my brights on and came to a stop. It wasn’t a dog. It was a beautiful gray wolf that sauntered in front of me across the road, casually as if to say, “Lab vakar!” I tried to grab my camera, and I rolled down the window, but she just walked into the darkness and disappeared. Just a bit of magic in the air, I think. I hope that the curvy road you’re on leads you to cool stuff like one-way dams, wolves, and a whole lot of whatever else you desire! Happy New Year! 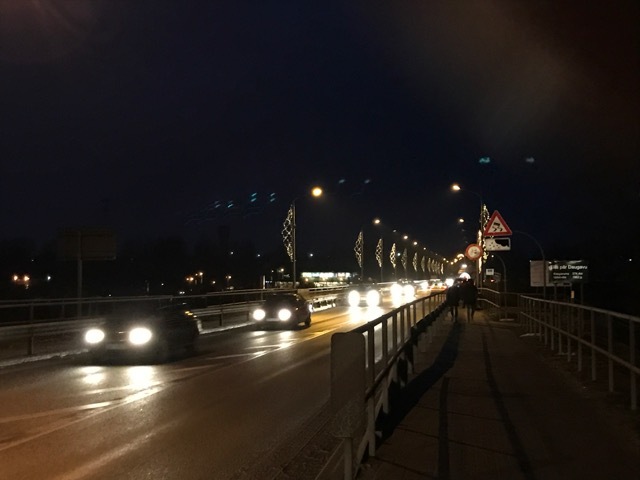 Laimigu Jauno Gadu! Ansis’ yard. What are black piles?